The Atmospheric Structure Instrument/Meteorology Package (ASI/MET) mast is visible against a backdrop of rocky Martian terrain in this image, taken by the Imager for Mars Pathfinder (IMP). The windsocks are slightly tilted, showing some wind activity. Distortions in the background are due to parallax. Mars Pathfinder is the second in NASA's Discovery program of low-cost spacecraft with highly focused science goals. The Jet Propulsion Laboratory, Pasadena, CA, developed and manages the Mars Pathfinder mission for NASA's Office of Space Science, Washington, D.C. JPL is an operating division of the California Institute of Technology (Caltech). 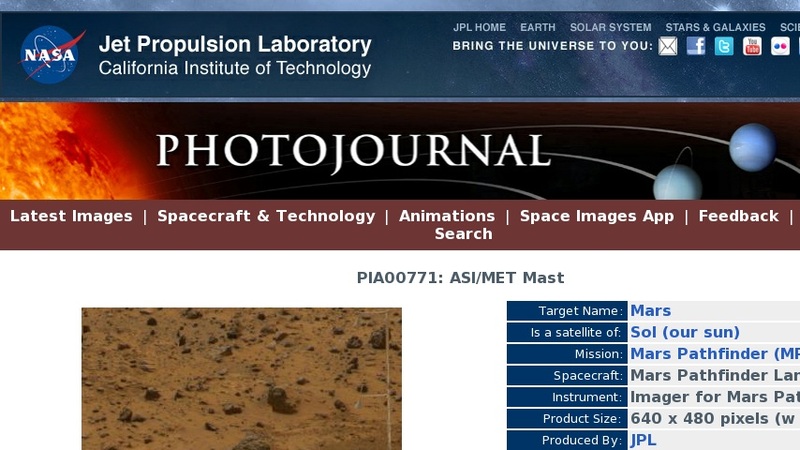 The Imager for Mars Pathfinder (IMP) was developed by the University of Arizona Lunar and Planetary Laboratory under contract to JPL. Peter Smith is the Principal Investigator.